How can I have more influence? It’s an important question in a crowded, noisy, competitive world. In theory there are many sources of power and influence: position, expertise, association, reputation, and of course wealth, if you’re lucky enough to have it. But most of these are difficult to acquire and highly dependent on the support or goodwill of others. Yet there is one source of influence that is uniquely within our own control: the power of the spoken word. History is full of examples, whether we admire their personalities and achievements or not, of individuals whose command of the spoken word won them extraordinary power and influence. The great Roman orator Cicero and the megalomaniac German dictator Hitler both rose from humble personal origins to the zenith of political power, heights likewise attained by under-achieving schoolboy Winston Churchill and America’s first coloured President Barrack Obama. Many other compelling speakers and communicators, unknown to most of us, have built and continue to build, successful careers in all the other, less public fields of human endeavour. Learning to be a powerful speaker, an effective user of words, language and talk, is entirely within our own control. Of course we can, and need, to learn from others, both how to do it well and how to avoid doing it badly, but the competence itself is there to be learned. This is the source of influence to which no one else can deny us access. What sorts of influence do we obtain through being a powerful speaker? A broad brush answer covers the obvious forms: effective speakers are the ones who are particularly good at engaging others and holding their attention, at presenting a point of view in a persuasive way, or demonstrating a compelling sense of direction. But although impact on others is the ultimate measure of a speaker’s power, these indicators do little to reveal the source of these forms of influence. 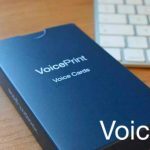 VoicePrint is a tool which sets out a more detailed, accessible and ready-to-use model of the pieces that make up influential speech. 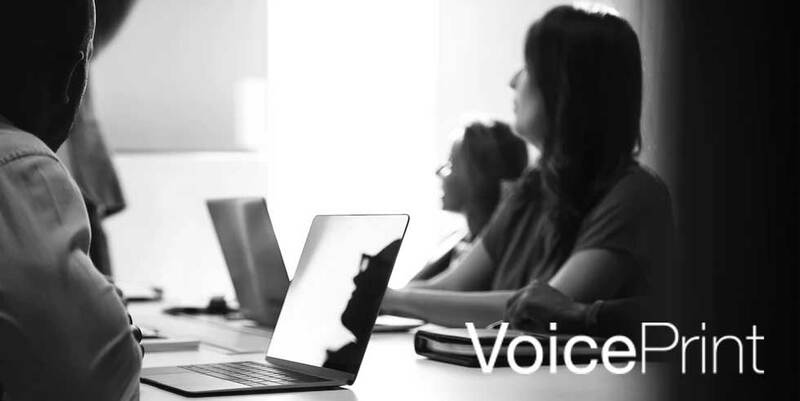 VoicePrint distinguishes nine specific ‘voices’ or ways of talking, each of which carries out a particular function, and each of which therefore represents a potential source of influence. The Articulate voice has influence because it clarifies. Think about how much misunderstanding and misapprehension people experience in the course of their work and dealings with each other. Articulating a lucid, intelligible exposition of things is an influential way of reducing confusions and tensions by providing a fresh platform of understanding, potentially a new basis for a way forward. The Advocate voice draws its power from personal conviction. 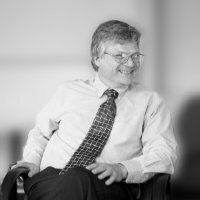 When discussions lapse, as they so often do, into abstractions like ‘brand’ and ‘customer satisfaction’ or generalisations like the need to improve ‘employee engagement’ or ‘cost optimisation,’ the individual who takes up and argues a particular position exerts influence by bringing into focus the need to take particular decisions and actions. The Advise voice draws influence from know-how. Opinion is plentiful, and the battleground of competing views is often the sticking point in which meetings get bogged down. Well-grounded expertise is invaluable, but only if its possessor knows how to turn her knowledge and skill into words and can express them in practical, digestible, audience-appropriate ways. The Challenge voice is influential because it keeps discussions on point. Wasting time, energy and patience in poorly-managed meetings is an experience that is enduringly familiar, frustrating and unnecessary. The individual with a skilful Challenge voice can interrupt and re-focus proceedings in a way that improves the process of what is happening. Others find this welcome and valuable rather than rude or offensive. The Direct voice has the power of authority; it tells others what they are required to do. It represents a different form of influence, because it won’t work unless it is perceived to be legitimate. Occupying a formal position, as leader, manager or chairperson, brings with it the opportunity to use the Direct voice. That’s why this is the only one of the nine voices that you cannot simply bestow upon yourself. If you’re someone in a position of authority but still uncomfortable with the Direct voice, remember that your role gives you both the right and the responsibility to use it. The Critique voice derives its influence from reasoning and logic. When opinions have been aired, ideas have been put forward, presentations and analyses have been made, that’s when the Critique voice is needed. Its value lies in the careful, balanced, thorough and objective evaluation of what has been said. It influences through the exercise of sound judgement. The Probe voice influences by bringing more into the open and into consideration. It’s the voice that digs below the surface. It’s especially useful when matters are uncertain or ambiguous, when circumstances are complex or political, and when people themselves are apprehensive, guarded or simply unsure. The individual who can delve sensitively, gradually uncovering more, is a powerful investigator and enlightener. The Inquire voice obtains its power from open-mindedness. In any situation where people yearn to be heard and helped, or, even more basically, to be listened to, respected and understood rather than ignored, overlooked or simply talked at, the effective user of the Inquire voice has influence that comes from asking and listening patiently and without preconceptions. 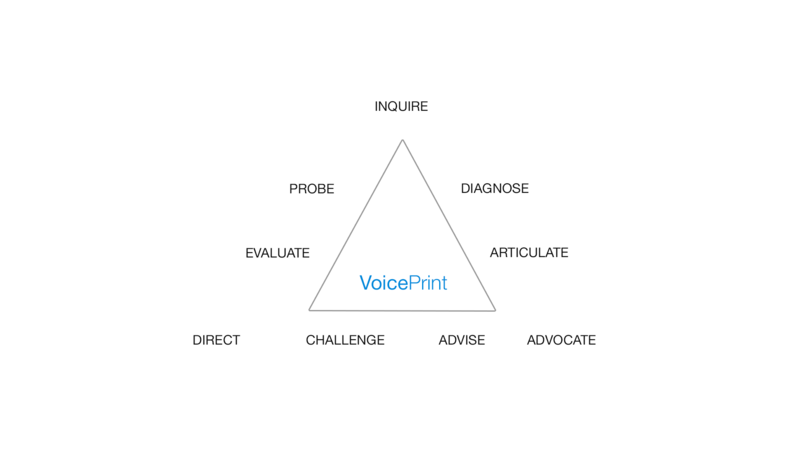 The Diagnose voice gets its power from making connections and finding significance. Organisational life is increasingly described as VUCA, volatile, uncertain, complex and ambiguous, hard to make sense of, hard to get a grip on. The user of the Diagnose voice is influential when, as is so often the case nowadays, issues need to be iteratively explored, more accurately defined and better understood before problems can be solved and opportunities realised. In short, the power of speech takes many forms. You can develop your own influence by having any of these voices at your disposal. You can develop your influence more by having a broad range of these voices. You can develop your influence further still by expressing each voice skilfully when you use it, mindful to make its actual impact on others consistent with its potential usefulness. 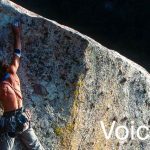 You can develop your influence best of all by having range, skill and above all sensitivity for when a particular voice is proving helpful or unhelpful and the agility to adapt your voice accordingly. 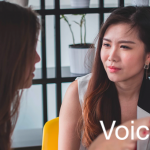 Learning about and expanding the distinctive tendencies, skills and sensitivities of your own voices is the purpose of the VoicePrint diagnostic. The journey towards having more influence as a speaker begins with greater self awareness of how you currently use these potential sources of influence. Contact us today, if you want to get insight into your personal VoicePrint profile and your own potential to have more influence.